Why Having a Vision is the Single Most Important Thing You Need for Success – You Brand, Inc.
Everything has to start with a vision. Maybe this realization is not earth-shattering — but I bet if you looked at those around and totaled up daily activities or achievements you might find that sure, we say it’s obvious, but having a vision and executing on that vision is a lot harder than it seems. What is your vision for your idea, your business or, if we get a little personal developmenty (yeah, I know it’s not a word), for your life? I can tell you that until recently the visions I’ve encountered weren’t real clear. Sure many are half there, but half way only creates half a vision and, in many ways, half of success. 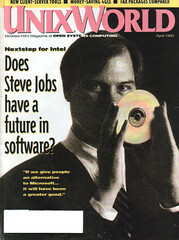 A few weeks ago the tech world was amazed by an audio of Steve Jobs and his predictions of the iPad, networking, etc. We are amazed by the precognition of this future teller, as we should be. So, let’s get a little personal. If a video popped up of you in 10, 20 or 30 years, how visionary would you be? Yeah, I have to call B.S. (can I do that?) because what separates today’s you from tomorrow’s (you know, the one who looks like a savant) is a clear articulation of your vision. More specifically, a vision that is so clear in your mind that you can painstakingly describe it in the minutest detail. If you can do that then you’re ready for the next step. Having a vision is only half of getting there. The other half is the execution of your vision, but even before that comes the plan. Most of us have a vision (or think we do). But a real gut check is to ask, Do you have a plan to attain that vision? Do you know the exact steps it will take for you to make that vision a reality? Have you ever deeply thought about it? Does it never really leave your mind? Now in leadership 101 they say it’s about sharing your vision and helping others see what you do. While I think that’s true, I believe it goes much deeper. It’s one thing to transfer a vision, but in order for the drive and passion to transfer, someone has to make your vision their own. That’s why it’s important to have a very clear vision of what you are trying to accomplish. No one will follow you unless they feel you have the plan and ability to make your vision happen. Let’s start with a vision. I realized that the lack of achieving the goals or desires I want in business and life came from a direct lack of a clear vision. Once I had that clear vision in precise detail down in writing I could then move on to how that vision will be accomplished. Step 1 – Have a Vision. Not much help here if you don’t know how to have a vision. I’ve heard (but can’t verify) that peyote helps, but I’m not sure that’s the type of vision you’re looking for. Step 2 – Clarity. Define your vision down to the smallest detail. Many people find this is the time to write it down. Write it down until you can’t describe it anymore, then write some more. Step 3 – Plan. Write down exactly how this vision is going to become a reality. This is where you begin to realize what it really is going to take to achieve your vision, the sacrifices or challenges you will face. It’s also where you will realize how little you know about how you’re going to make that vision happen. Another thing I find is we tend to really underestimate our abilities and the time it will take to achieve any vision. So take your plan and multiply it by at least 3. Step 4 – Act. If you got here that means that your plan didn’t scare the heck out of you. You’ll also realize that many things within your plan are completely outside of reality. That’s good. Most plans are. But the sheer act of attuning your mind and effort towards your vision (combined with action) means your vision has a greater success of becoming reality. We could talk about setting goals, aiming high, etc., but instead, let me go back to the product I spoke about earlier. What I didn’t share is I built that myself. I learned how to code in WordPress from the ground up. I did that because in December I had a vision … a vision of a WordPress curation platform that I wanted to use, one I didn’t readily see available. I still remember starting to code early Saturday morning (yeah, kind of lame, but I couldn’t sleep that’s how powerful the vision was). By Tuesday I was showing my first version to Adam here at You Brand, Inc.
From that vision we created a new revenue stream and a new product. As I look back I realize I went through all four of those steps. But this wouldn’t have happened without a vision and I’m convinced this has to be the starting point of each and everything you want to achieve. Without a vision you’re in complete darkness. With a vision you have your cell phone lighting your way (we all do this now, don’t we?). Once you’ve written down your vision in detail, suddenly the lights just turn on. Now you can see. You sit down and plan how you’re going to make your vision a reality and suddenly it’s daylight and the sun is shining bright. Now that you can see for miles around you it’s time for you to go outside and act. That’s where I intend to go. Now for that strange vision I had, it simply was a vision of what would happen if I continued to lack vision. Whoa. 2nd image of Steve Jobs from mrbill. Attaining goals, driving revenue, leadership… it’s all about your clear and concise vision. If you have this figured out then you’re probably wildly successful, so stop reading. Otherwise, please continue. Previous article Is Personal Branding Right For You?